Leach • Remmers Heating & Air Conditioning delivers a full range of services to our customers with a focus on maximizing efficiency and minimizing your heating and cooling costs. We repair and replace all heating systems – from electric and gas furnaces to boilers and heat pumps. We can make suggestions on the right choice for your home or business and we offer free consultations. If you’re interested in saving up to 30% on heating costs during the winter while still staying toasty warm, we can fill you in on ENERGY STAR rated heating systems. A malfunctioning air conditioning system can be a major headache, so the Leach • Remmers team makes quick and effective service and repair its number one mission. And when you need a new system, count on us to assess your home or business for free and design a system to fit your situation and budget. We also provide indoor air quality products and dehumidifying to ensure your comfort on the hottest days. 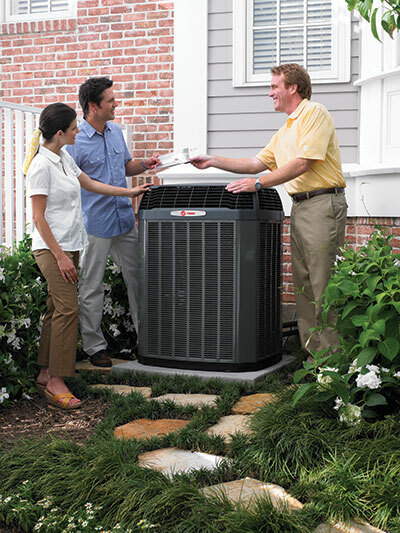 In the spring and fall, it is a good idea to have your system checked out by one of our maintenance pros. We’ll inspect and clean your air conditioning and heating system to enhance performance and helps prevent expensive breakdowns. For set-it-and-forget-it peace of mind, we offer annual preventative maintenance plans that keep your equipment running smoothly to sustain your comfort and save you money year round. Ductless Mini-Split Systems are perfect for sunrooms or other small spaces where adding ductwork might be difficult or undoable. Providing efficient cooling and heating to compact living environments, these systems offer increased comfort, enhanced energy efficiency, and quiet operation. The ductless pros at Leach • Remmers can install this practical comfort solution to a single room in your home or several. The Leach • Remmers in-house ductwork shop enables us to quickly and precisely custom fabricate duct systems for homes and businesses. We provide installation with a well-trained crew and carefully plan the work to keep your project on schedule. At Leach • Remmers, we know how to install and service geothermal systems to enhance your heating and cooling performance year-round and provide substantial energy savings over the long run. Tapping into the earth’s consistent underground temperatures to regulate the comfort of your home with great efficiency can be tricky. Our experts get it done right. We excel at designing heating and cooling systems for new homes or additions to existing homes. Call Leach • Remmers for the area’s most dependable design and project management. Have a question or need service? We’re always available to give you info you can use or some timely help. Call us at (217) 243-7666.